Towards the end of my recent three week family holiday in Canada I spent a few days in the beautiful fishing village of Ucluelet. Ucluelet is situated on the west coast of Vancouver Island a few hours drive from Victoria and is well known as a hot spot for those wanting to see whales and other wildlife such as bears.and bald eagles. It is a sleepy little place but beautiful and gives a good taste of the Pacific Rim National Park of Vancouver Island. 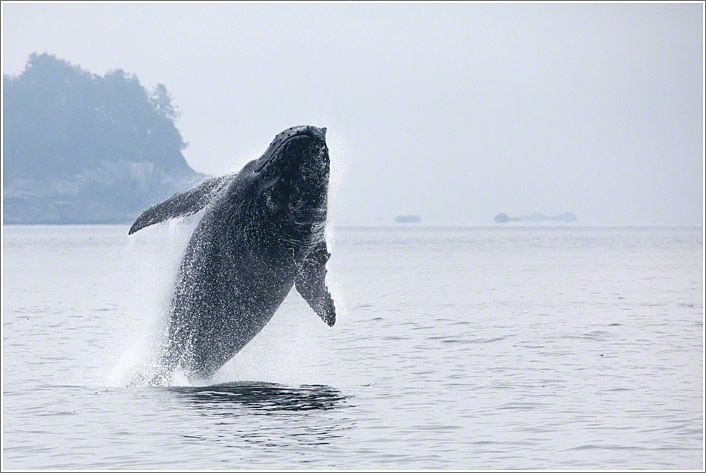 While in Ucluelet I went on two whale watching cruises with Toddy and Al of Archipelago Wildlife Cruises as they 'sail' through Barcley Sound and the Broken Group Islands. The boat that this operation uses is perfect for photography. Unlike many whale watching outfits that cram a lot of people onto a small boat for a couple of hours, Archipelago Wildlife Cruises have a spacious cruiser with a large deck area on the bow where I could lay out my camera pack and equipment for quick access without worrying about being in anyone else's way. I was able to stand on the deck and get perfect views where ever the animals were as motored through broken inlet. The first trip was pleasant and sunny and we saw both Gray Whales and Humpbacks Whales, bald eagles, California Sea Lions and Stellar Sea Lions. The Humpbacks were impressive and I got some beautiful back-lit tail lifts such as the one below but they did not play up for us with the breaching they are famous for. I decided to take a chance and go on another trip two days later. The second trip paid off in spades with some beautiful misty, grey, overcast lighting and several energetic whales breaching and tail slapping and rolling around with their enormous mottled, white fins waving. Scientists don't really know why humpbacks do this but to me it just looked like they were having fun. Seeing an enormous whale breaching and landing in a volcano of sea spray less than one hundred metres from the boat is truly one of natures amazing spectacles and something I will remember for the rest of my life. Aside from the wildlife, the scenery of the Broken Group Islands is incredible. Magical little inlets and bays and tiny rocky islands covered with coniferous rain forests, and even the occasional surprising and nearly hidden sandy beach. The rocky shoreline is resplendent with colorful starfish and seabirds, the forested slope green and lush, here and there a bald eagle perched watchfully on a favorite look out. If you are lucky (and we were) you can even see black bears coming down to the water and foraging among the rocks for crabs or other morsels. For both trips I used both Canon 500mm F4 L and a Canon 100-400 F4 L lenses. Of course shooting from a moving boat means a tripod is out of the question so hand holding was the name of the game. Hand holding a 500mm lens particularly on a pitching boat is not the easiest thing to do and is very tiring (it is a heavy lens) but I persisted with it and got some really good results. 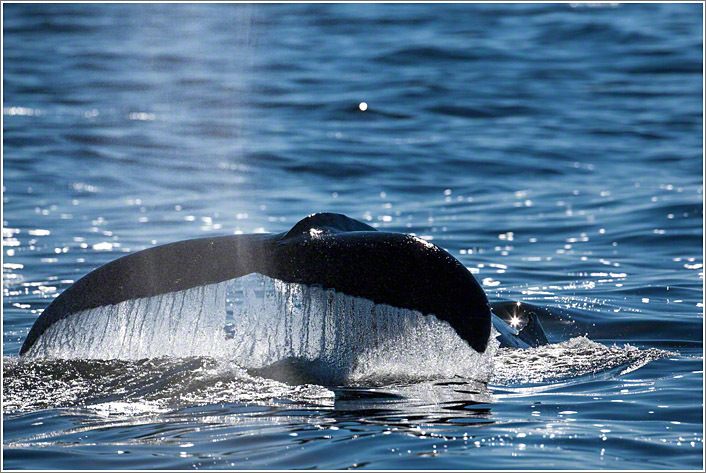 My usual strategy was to use the 500mm while approaching a whale then change over to the 100-400 once we were within range. I had a Canon 5D Mk2 on each lens so did not have to muck around changing lenses in the thick of the action. In terms of the camera body I mostly used the Canon 5D Mk2's even though I had a Canon 7D body with me as well. For those that don't know Canon bodies, the 5D is known more as a landscape or general purpose camera rather than a wildlife camera as it has a fairly basic auto focus system and a slow frame rate of around 4 shots per second. The 7D is much better in those regards with 8 shots per second and better auto focus system but I didn't use it much as I was operating at quite high ISO's of 1000 and up to keep my shutter speeds up and the 7D images are very 'noisy' at these levels. This was actually one of the few occasions when I have felt held back by my camera bodies as I needed the amazing high ISO image quality of the 5D Mk2 and the frame rate of the 7D. In any case I am still very happy with the shots I got. 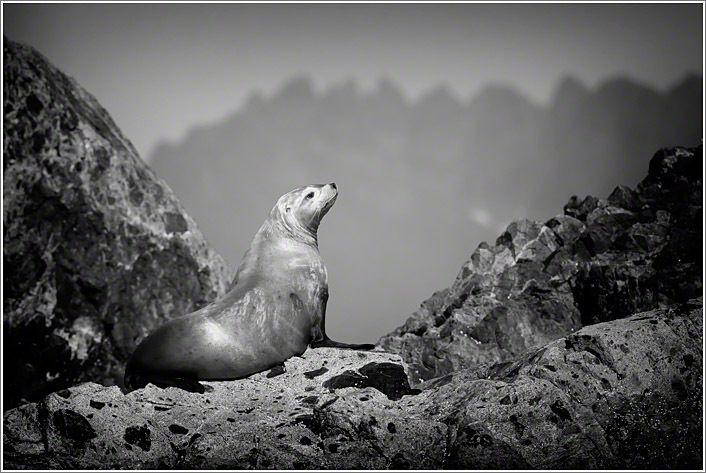 One of the other opportunities was shooting seals on some rocky islets (sort of rock outcrop sticking out of the water). This was extremely challenging as the boat was rocking a lot being in shallow water and I needed to use the 500mm to get in close enough. Picking out nice compositions from a moving feast of rock and sea lions is tricky and and I kind of had to resort to the 'spray and pray' technique of shooting. The first image below is one of the intentional compositions I found while looking through the viewfinder and knew I had something nice the instant I hit the shutter button. There are opportunities for whale watching and whale photography at locations around Australia but none of them come packaged with the sort of scenery and wildlife that was on offer in Ucluelet. If I ever find myself in Western Canada again I will surely come back here for another visit. Botswana Birding Experience - The Heronry.